MyoScan-Pro is a pre-amplified surface electromyography sensor which outputs RMS sEMG. sEMG. Includes a range switch to change filter settings between 0 – 400 μV Narrow filter, 0 – 400 μV Wide filter, 0 – 1600 μV Wide filter with < 0.3 μV noise. Narrow filter = 100- 200 Hz; Wide filter = 20-500Hz. Compatible with Triode electrodes or extender cables for wider placement of electrodes. The MyoScan-Pro line of sensors is differential amplifier of surface electromyography (sEMG). This means that whatever electrical activity is common to both sites is rejected, and what differs is amplified. Surface EMG is a non-invasive measure of underlying muscle activity by detecting and amplifying tiny electrical impulses generated by muscle fibers when they contract. The sensor detects and averages a complex addition of impulses from many muscle fibers within the recording area of the sensor, contracting at different moments and at different rates. The number of muscle fibers that are recruited, and the rate of firing (contraction) of each fiber, during any given contraction depends on the force required to perform the movement. Because of this, the intensity (amplitude) of the resulting electrical signal, under certain condition, is proportional to the strength of contraction. 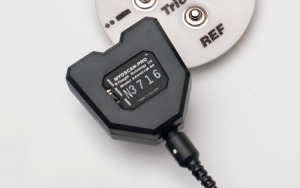 The MyoScan-Pro sensor senses and amplifies EMG signal and then performs an analog root mean square (RMS) conversion on the signal. It results in a relatively slowly changing signal which follows the amplitude of the input EMG signal, and which can be sampled at a lower rate that what is required for raw EMG. In the 400W (wide bandwidth) position, the sensor will be sensitive to the full 20-500Hz bandwidth. SEMG signals recorded from upper body muscles may contain EKG interference from heart muscle. This is usually seen as a spike occurring at every heartbeat. This noise can be filtered out by moving the switch to the 400N (narrow bandwidth) position. In this position, the sensor will only be sensitive to frequencies between 100 and 200 Hz. While the 400 (W and N) settings provide good resolution for most of the body’s muscles, the third position, 1600W is for monitoring larger muscle groups like thigh muscles, where the signal level may go above 400uV RMS. In this setting, the sensor responds up to a level of 1600uV RMS. Since the MyoScan-Pro uses internal electronic circuitry to perform RMS conversion, small offsets are sometimes observed in the sensor reading. For that reason, it will occasionally be necessary to zero your MyoScan-Pro sensors. Zeroing is done by connecting the zeroing plug to the sensor box (plug it where the extender cable connects). With the zeroing plug on the sensor, the reading should be zero. If your software displays a different value, usually plus or minus a few microvolts, then you should be able to correct this offset, from within the software, by using a zeroing function. Keep in mind that each sensor may have different offset values, and that the offset may change, particularly with temperature. Remember to remove the zeroing plug after adjusting the MyoScan-Pro sensor’s offset. Although it is possible to use the MyoScan-Pro sensor with dry electrodes and no skin preparation, doing so increases the chance that artifacts will distort the signal. As a general rule, skin preparation enhances signal quality, reduces artifacts and minimizes the need for post-recording artifact rejection. At a minimum, make sure that before applying the EMG electrodes the skin surface is clean and dry by rubbing it with an alcohol pad. However, to significantly reduce artifacts, we recommend abrading the skin with an abrasive cream, such as NuPrep (10-30), to remove dead skin. If necessary, shave excess body hair. For best results, silver-silver chloride electrodes are recommended for electrical contact between skin and sensor. The single-use Triode electrode (T3402M) should be your first choice. It can be snapped directly on the sensor head, which makes it very easy to use and quick to position. The signal is then amplified right on the muscle site, which dramatically increases the SNR (Signal-to-Noise Ratio) and therefore limits pollution of the SEMG signal by surrounding electromagnetic fields and movement artifacts generated by wires being pulled. The distance between the electrodes is also optimal (standard 2cm) for avoiding or limiting muscle crosstalk. Conductive gel is recommended for optimal electrode-skin contact. The gel can be applied to the center (on the grey area only) before applying to the skin. Make sure the electrodes are placed firmly on the skin. The UniGel electrodes (T3425) provide total freedom in term of placement. Their small size also allows placement on very tiny muscles (such as SCM). They are not attached together, which prevents them from moving on the skin when positioned on muscles with great deformation while contracting. These electrodes are pre-gelled and so do not require the addition of conductive gel, which reduces the time of preparation for this type of electrodes. 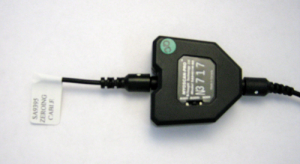 An EMG extender cable (T8720M) must be connected between the electrodes and the sensor. The MyoScan-Pro sensor is designed to coexist with other Thought Technology bio potential sensors such as T9306 (or T9307) EKG sensor, T9305M EEG sensor, T7680 EEG-Z3 sensor, or SA9309M Skin Conductance sensor. To ensure correct MyoScan sensor operation, if sensors from another manufacturer are in the same electrical circuit and connected to the same subject, their electrodes must function at a voltage within the specified operating bias range, 1.0 to 3.0 volts above sensor ground. To check whether another sensor is interfering with the MyoScan sensor operation, connect and disconnect the other sensor from the subject, and note whether this causes a change in the MyoScan-Pro sensor signal level, or whether connection of the other sensor appears to cause any signal artifacts in the EMG signal. The formula takes into account the 2.8 V item in Vout. the 2.8 V item is present if the TT Sensor Isolator used; it is absent (subtract it from Vout) if the EMG sensor is directly connected to a Data Acquisition card, and if a resistor is connected across its output (see section below).